Like Paddy Moloney of the Chieftains, Manhattan-based singer-songwriter, bandleader, novelist and playwright Larry Kirwan of Black 47 keeps bringing Irish music to the masses. And like the Chieftains, the guys in Black 47 tend to get really busy this time of year, leading up to the end of March and of course, St. Patrick's Day on the 17th. Kirwan will have plenty of reasons to celebrate tonight at the Stone Pony, 913 Ocean Ave., Asbury Park. His new novel, "Rockin' the Bronx," will be released Feb. 23, and the band's new album, "Bankers and Gangsters" is due March 2 on the UFO Music label. Both are available now from http://www.black47.com/. 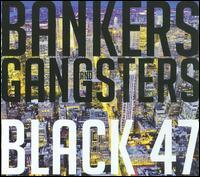 Black 47's last album, "Iraq" was a concept album, dedicated to the soldiers fighting in Iraq, while "Bankers and Gangsters" "is more a mixture of different types of songs. It's still a rock album, but the songs are diffuse and all over the map in the usual Black 47 kind of way." "There is more of a theme to this in that I decided to write songs that would feature the horns and the (uilleann) pipes more on this album," he explained. "We came up with some beautiful horn arrangements, and you don't hear them much anymore in rock music." 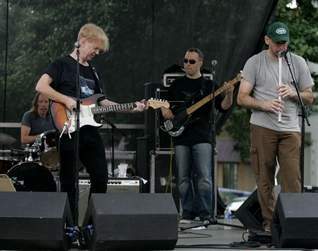 Aside from Kirwan on guitar and lead vocals, Black 47's seasoned veterans include Geoffrey Blythe (former Dexy's Midnight Runners) on tenor and soprano saxophones, Fred Parcells on trombones and penny whistle, Joseph Mulvanerty on uilleann pipes and flute, Joe Burcaw on bass and drummer/percussionist Thomas Hamlin. Kirwan said his guitar is very much an accompanying instrument on "Bankers and Gangsters," resulting in a refreshing change of pace for a rock band. "The way we've always used brass is different than the American way, though I love those old Otis Redding recordings," he said, "because the roots of Black 47 is playin' in pubs, we came it at from more of a jazz point of view. Whereas in our shows you can have two or three instruments playing solos off each other, in most American rock, it's a defined section where the horns come in. That's more the John Coltrane and Miles Davis influences." Their live show tonight at the Pony will likely be a lengthy set showcasing plenty of improvisational skills of all the band's members. "People take solos and you feel the music that much more," Kirwan argued. "To me, a good song is like a football. You can kick it where ever you want it and it will always come back to you in its proper shape. A good song is a good idea, and you can turn it inside and out in the way the classic jazz players do." Black 47 will be performing plenty of songs from their forthcoming "Bankers and Gangsters" album tonight, "as well as plenty of the old favorites, too," Kirwan said. You'd never know it from listening to his latest release, "Steve Conte and the Crazy Truth," but the Matawan-raised guitarist, vocalist and bandleader cites Wes Montgomery, Django Reinhardt, Charlie Christian and Muddy Waters as among his most important influences. That's because Conte had hipster, jazz-head parents who also appreciated blues and folk music, and they exposed Conte and his other siblings to this wealth of music in their youth. Conte performs frequently with his brother, John Conte, on bass. Their mother is jazz singer/impresario/therapist Rosemary Conte. Steve Conte, who has been ably backing singer David Johansen in his revived New York Dolls project since 2004, performs with his own band Saturday night at the Wonder Bar in Asbury Park. In recent years, he has toured with the likes of Willie Nile, Eric Burdon and the Animals, Paul Simon and Maceo Parker, to name a few. Conte celebrates the recent release of "Steve Conte and the Crazy Truth" Saturday night at Wonder Bar, Fifth and Ocean avenues, Asbury Park. The other members of his trio include Lee Kostrinsky, bass and backing vocals, and Phil Stewart, drums/percussion and backing vocals. Call 732-502-8886. Richard Skelly hosts the "Low-Budget Blues Program" 9-11 p.m. Thursday WRSU, 88.7 FM; www.nj.com/wrsu.